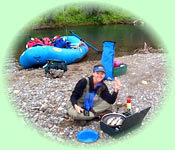 Southwestern Alaska is full of pristine winding and converging rivers that teem with fish and wildlife. Each river has its own flavor, allowing you to choose the ideal setting and pace for your particular floating journey. Some trips are so remote that you may not come across a single soul - it will just be you and the river. 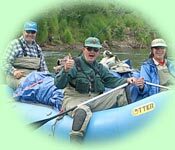 We provide the best gear and service available for all float trip river adventures, including self-bailing Otter rafts, pumps, patch kits, dry bags, marine radios, and much more. 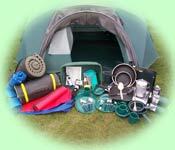 Prices will vary with trip destination and duration, as will your equipment list. Both guided and unguided trips are offered. Call us today to create the custom trip that you've been dreaming about for years! With this trip, you only have to fly one way and you float all the way back to town. A trip for the experienced rafter (depending on the access point), as some of the bends are tricky. 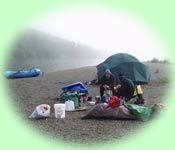 The river section between Aniak Lake and the confluence of the Kipchuk and Salmon rivers can be challenging with significant debris loads and log jams making floating arduous. Most rafters select the less challenging float route from the wheel aircraft strip at Bell Creek on the Salmon River. Except for the lower portion, the Aniak River is swift flowing and is not confined to a specific channel. Multiple channels and submerged debris and logjams require floaters to navigate narrow channels throughout most of the float trip. 8-10 day float. Typical of lower Kuskokwim streams, the upper section flows through moderate sized Kilbuck Mountains (2,000 to 3,000 foot elevation) and gradually transition into Kuskokwim lowlands and tundra. The river changes from swift water in the mountains to gradual slow meandering course in the lowlands. Taiga forest vegetation, including black spruce, birch, aspen, balsam poplar and alders, lines the banks of Kuskokwim lowland streams. This scenic, clear water tributary tof the Yukon River is an easy float (Class I & II) through beautiful surroundings that are forested to the headwaters. A less visited river means you will hardly see anyone on your trip! Great fishing for King Salmon, chums, and silvers, Arctic Grayling, Char, Pike, Sheefish, & Dolly Vardens. The Headwaters to Yellow River has a medium gradient with pools, riffles, and frequent small sand/gravel bars. Some tributaries have a significantly higher gradient, such as Canyon Creek. From Yellow River to the mouth, the river becomes a lower gradient stream changing to a single channel meander. The lower river from Theodore Creek to the mouth, is also a single channel meander with attached oxbow lakes and a low gradient. This lower section of the river is better fishing for northern pike than in the upriver sections. Sheefish are also available near the mouth and are best fished for in early June and September. The beautiful Holitna is a very easy flowing, mostly flatwater river that anybody can float (Class I & II). You will pass through forests of black and white spruce, poplar, birch and cottonwood, and you may even drift for days without seeing many other people. This is an easy float (Class I & II). The river initiates at large Whitefish Lake and passes through a lot of windy, slow turns moving on its long trip down to meet the Holitna River. It is the most remote, least traveled river, and it is very unlikely that you will see any other people. The upper river starts above treeline in the tundra, then lower down travels through mixed white and black spruce and poplar forest. 5 to 10 day float. The Innoko is the westernmost major tributary of the Yukon River. 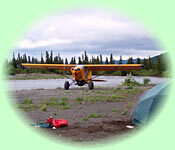 It is a very slow, easy river in a remote and isolated setting. 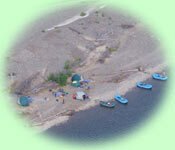 Past Shagaluk, water levels are low and the current is especially slow. The Innoko rises in the Kuskokwim Mountains west of the town of McGrath and flows north, then southwest for about 500 miles (800 km) before joining the Yukon near Holy Cross. Most of the river basin lies in the Innoko National Wildlife Refuge. The refuge is visited by an estimated 130 species of birds, and more than 300,000 migratory nesting waterfowl and shorebirds. Frequent flooding supports willow sandbars, providing habitat for moose and beavers. Year-round residents include peregrine falcons, black and grizzly bears, wolves, marten, lynx, red fox, river otter, and wolverine. Winter brings Beaver Mountain caribou. 5 to 10 day float. 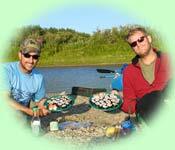 This river, also known as the Upper Nushagak, is a very easy float (Class I) that anybody will enjoy. The water is crystal clear with good steady flow, sometimes slowgoing, sometimes fast with deeper pools. You will be surrounded by beauty. In the distance by rolling tundra hills filled with berries, while the river corridor is narrower and secluded by lowland brush. Further downriver, the scenery turns wooded. Moose and caribou wander these areas. You will also see more black bears than on other rivers, since the King Salmon is further inland. 5 to 10 day float. 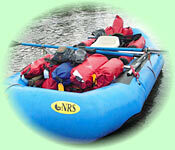 A popular and easy float trip of intermediate duration for the experienced rafter. The upper river is swift, with long stretches of shallow rocky rapids. There are four short Class III rapids and a small waterfall that are all easily portaged along the bank. You will also pass Kisaralik Lake. 8 to 10 day float. Typical of lower Kuskokwim streams, the upper section flows through moderate sized Kilbuck Mountains (2,000 to 3,000 foot elevation) and gradually transition into Kuskokwim lowlands and tundra. The river changes from swift water in the mountains to gradual slow meandering course in the lowlands with poorly defined channel in several locations. Taiga forest vegetation, including black spruce, birch, aspen, balsam poplar, and alders, lines the banks of Kuskokwim lowland streams. What is the Gear Like?